Located amongst the shops of Royal, this is an interesting place that offers a daily jazz brunch buffet. 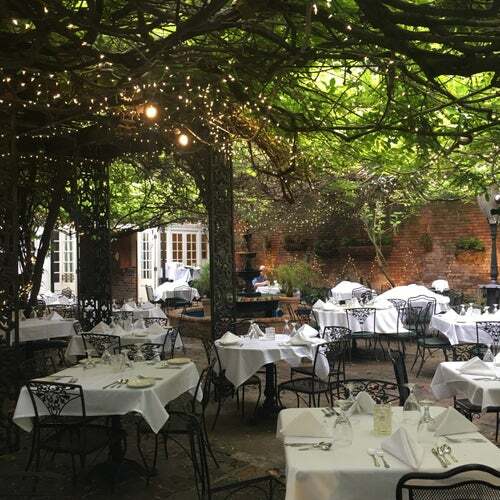 The natural, romantic setting makes dinner a little hard to attend without prior reservations. Loved it and will do it again. It's not cheap ... but the food and atmosphere are excellent! Yep. Great space, it was. And the food and service was one to remember... Sit outside if you can. Let me say it has been a very long time when I first visited the restaurant. But I had a wonderful dinner out in the courtyard.The service was topnotch and the food was even better too. Make sure you leave room for their banannas foster.MMMM-MMM Great! With GREAT food, a relaxed atmosphere and a live jazz band this is the perfect way to start your Sunday morning. A little pricey but worth it!